Remember when “gift of the month” clubs were reserved for chocolates and flowers? These days, there are monthly subscriptions for just about anything, for just about anyone: new moms, make-up lovers, foodies, crafters, wine enthusiasts (hi), pet owners…even the pets themselves. I’m a subscriber to Birchbox. Every month, I receive a pretty box filled with sample-sized beauty products based on my preferences (natural and non-trendy). I have the option to go to their website and purchase full-sized products at a discount. 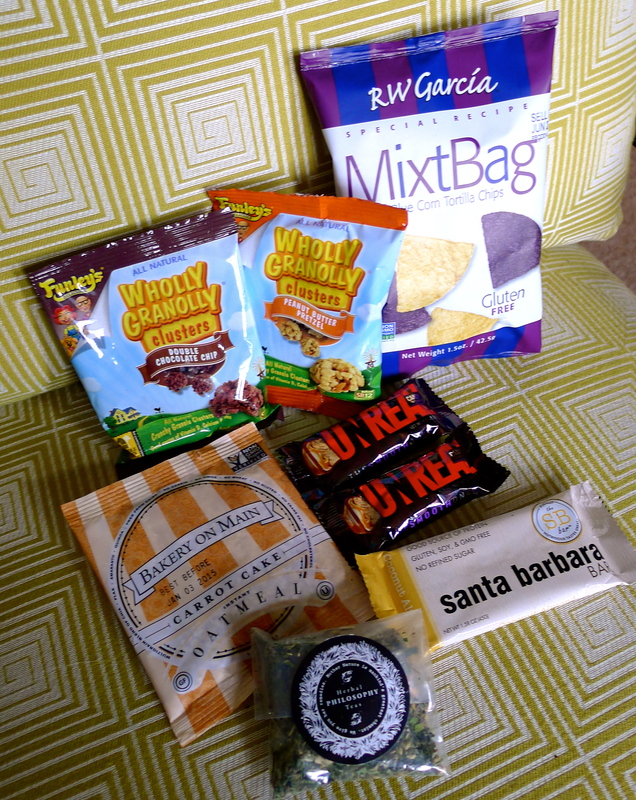 It’s so fun to get a box of samples in the mail that I’ve given subscriptions as gifts! I also recently stepped into the world of StitchFix– a stylist chooses clothes for me (again, based on my preferences), which are delivered to my door. Those I like, I keep and pay for. Those I don’t like go back at no cost- they even include the pre-paid return shipping package. The convenience of to-your-door delivery along with the online purchase option (not to mention the delight of receiving a “present” in the mail!) makes these subscriptions popular and fun. Instead of booze or sweets, what about healthy food? Anyone who’s wandered the aisles at Whole Foods knows that the good-for-you food trend is here to stay. Organic. Gluten-free. Vegan. No GMO. 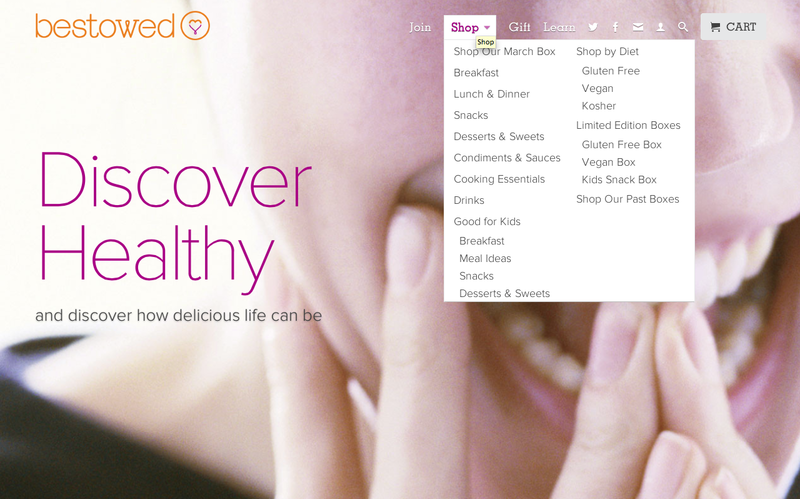 There are countless options to cater to specific dietary needs or health-conscious lifestyles. We’re lucky to have good food available to us, but how do you know the tasty options from the ones that taste like cardboard? I can’t count how many times I’ve bought a pricey box of organic whatever, only to taste said whatever– and have it grow stale in the cupboard, ignored. Enter Bestowed. 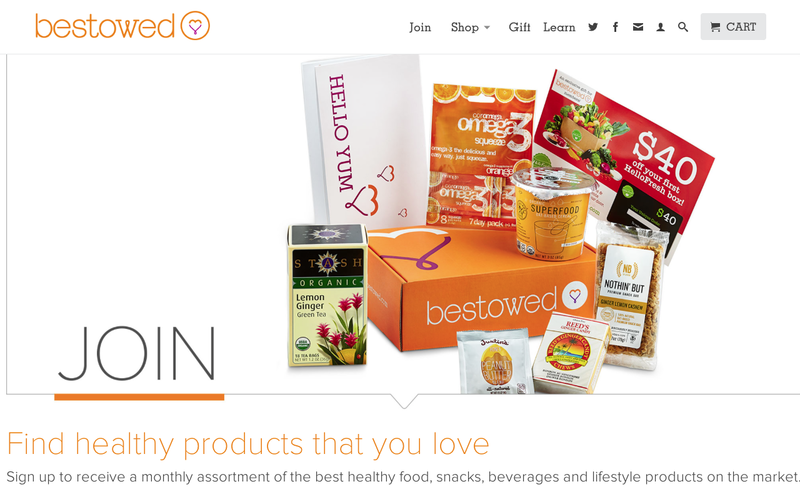 Bestowed is a company whose goal is to help people find healthy products they love. With their monthly subscription, you can receive samples of good food- snacks, sauces, seasonings, beverages- all with your health in mind. Smoothie packs. Protein powders. Soup mixes. Sweets. Breakfasts. Bars. There are diet-specific options (gluten-free, vegan, kosher). Many of the items they offer are those I’ve been wondering about on the shelves at Whole Foods, and the Bestowed samples allow me to try these goodies- and give me the option to purchase what I like online. I received the February Bestowed box to test out. What a treat! 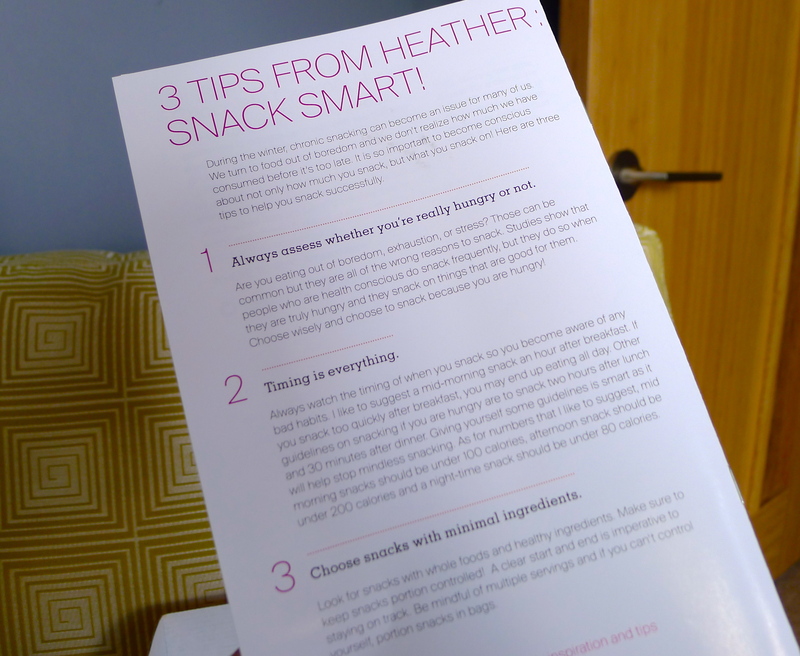 The first thing I saw when I opened the box was a simple pamphlet- Hello Yum. 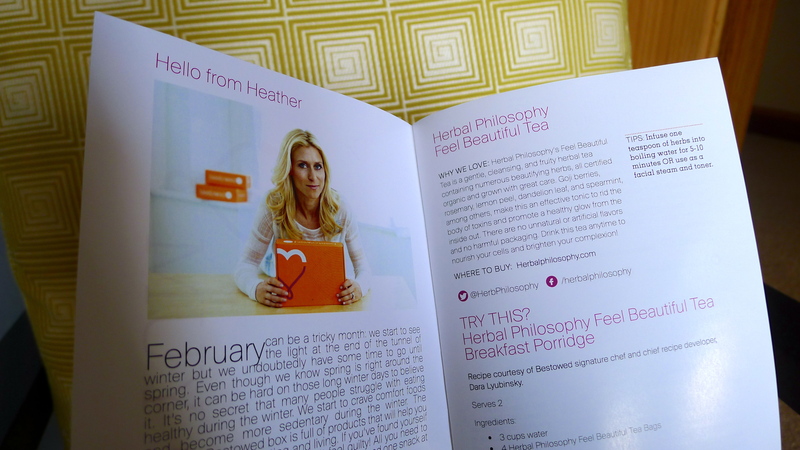 Inside, there’s a note from Heather, the founder of the company, explaining the theme of this month’s box. Following, there’s a description of each item in the box, including other options for purchase than Bestowed’s website, tips on how to fully enjoy each item, and even a recipe or two! Inside the box, there weren’t just a couple of small sample-sized snacks. There was an array of full-sized products (8 in total! 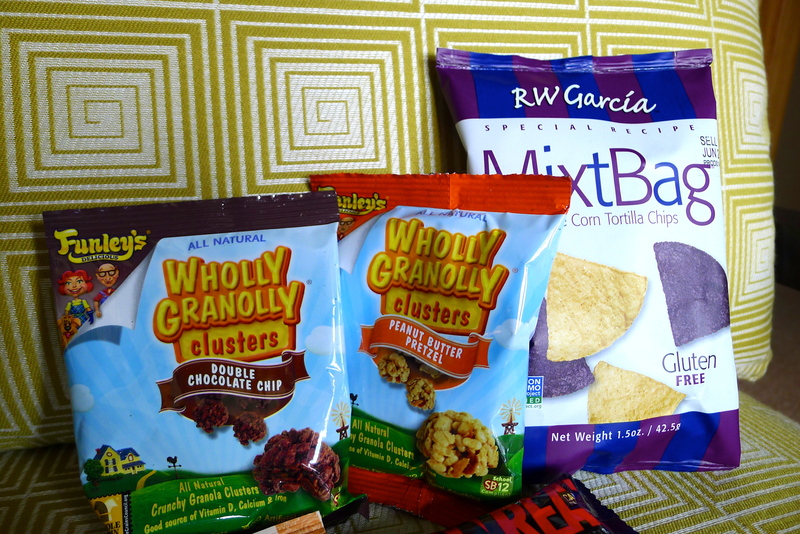 ), from chips to granola clusters to energy bars to chocolates to oatmeal to herbal tea. 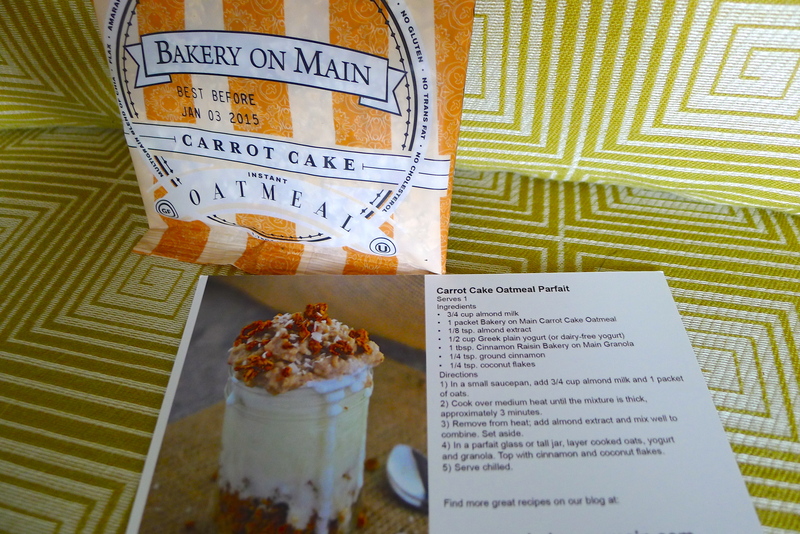 There was also a coupon and a bonus recipe using one of the products. 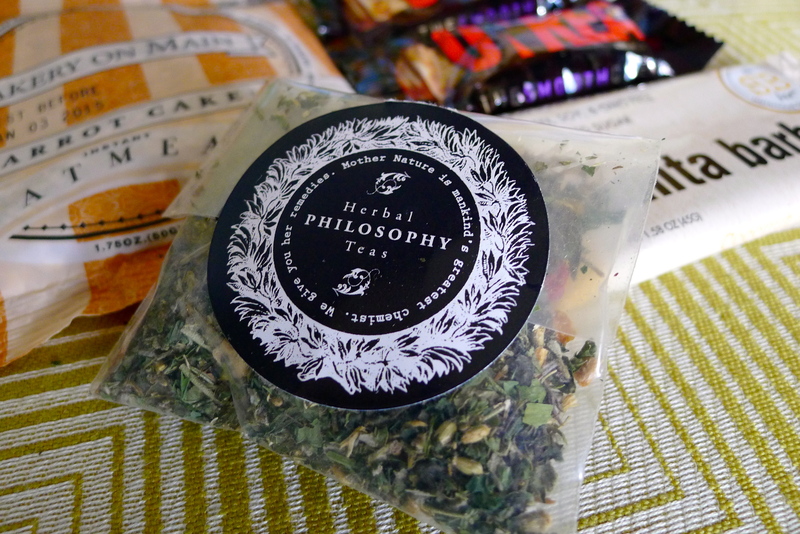 Each of the goodies falls into the health-conscious category. The chips are gluten-free. 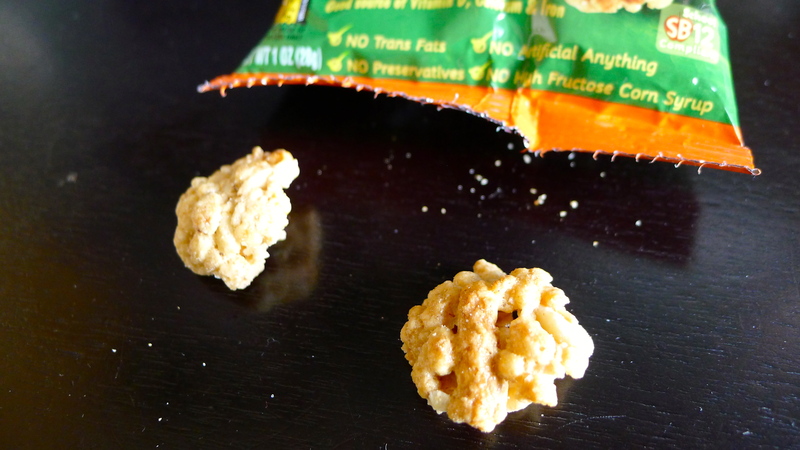 The granola bites are all natural, with “no artificial anything.” The oatmeal is non-GMO product verified. 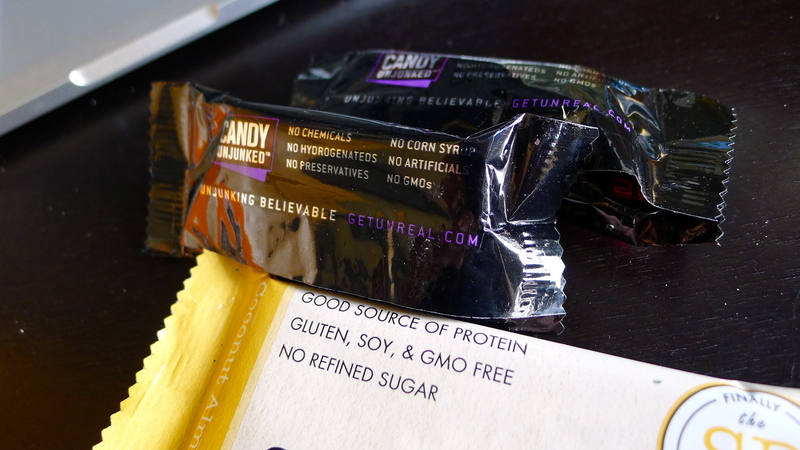 The labels on the energy bar and candy treats list ways in which they’re different than other bars you find in grocery stores. It’s simply a box of healthy love. I snacked on the peanut butter pretzel granola bites while I wrote this- delish. I also tasted a corn chip or two- no difference in taste than the generic brand I have in the pantry, just better for me. John is known to get up for midnight snacks- he’ll devour these goodies. 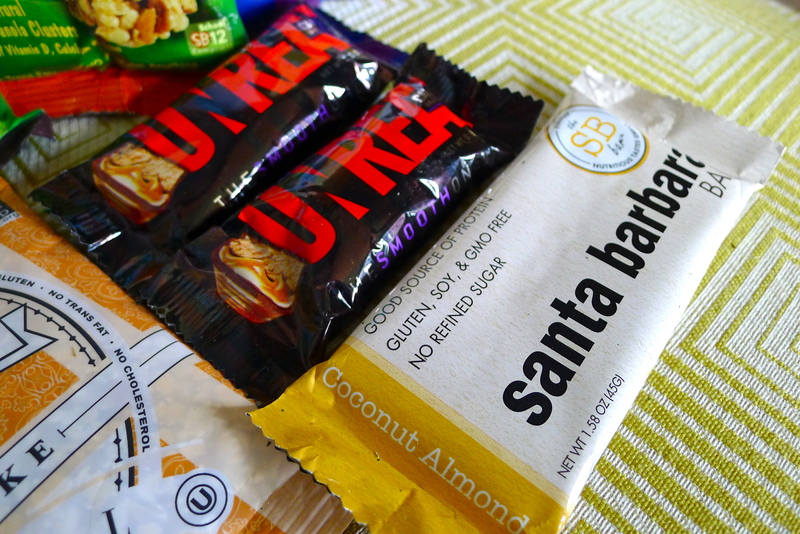 He also likes having healthy options to stash in his pack for big ski days or bike rides. These samples give us the chance to find out what we like or don’t like- it takes the guesswork out of scanning the shelves at the store. And if it’s not on the shelf, I know where to buy it- thanks to Bestowed. As a side note, I feel it’s important to include that I wasn’t paid to write about Bestowed or their products. I was sent a box to try, and I am honestly impressed. I believe in nourishing our bodies with real, good food. It’s just as easy to choose good-for-you options than not, but making a healthy lifestyle change can be intimidating. That’s why I wanted to share this company with you- it’s a fun option that could introduce you to foods you wouldn’t otherwise try. 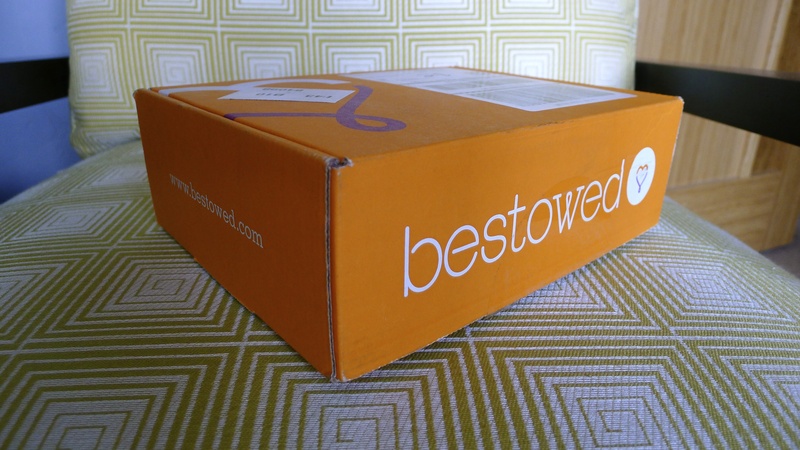 Learn more about Bestowed, their subscription service, and their product options here! Are you a member of any monthly subscription clubs? Share with me! One year ago: Beating Park City’s schizophrenic springtime weather with a desert road trip. Previous postTilapia Tacos with Chunky Green Sauce. Have you seen Bark Box? Looks so cute! But I worry that Cholula MIGHT already be a little bit spoiled…. I have seen Bark Boxes before, we’ve not signed up for any just yet. We’ve had a couple given to us though to review and they always have awesome things in them. 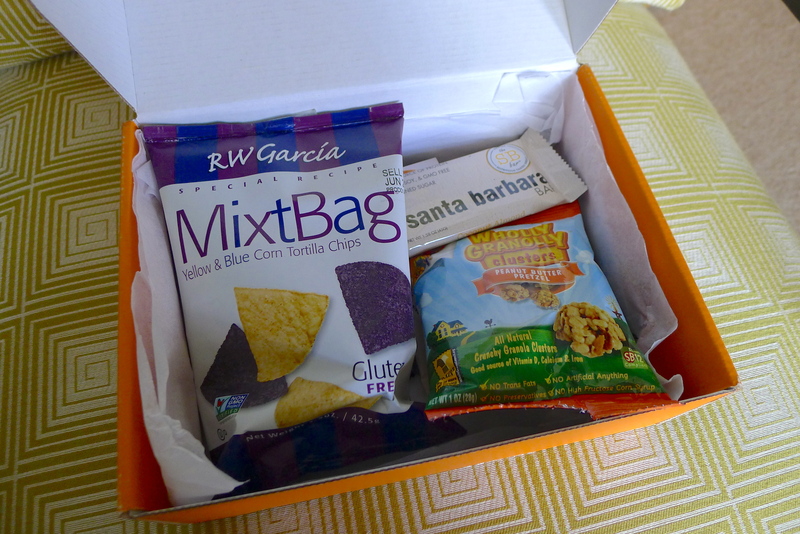 I so want to try one of these subscription boxes, and this one looks fantastic. Also I’m hungry right now so there’s that. Oh, I’ve gotta try this!